Samsung this week demonstrated progress in its new NF1 form-factor (formerly known as NGSFF and sometimes called M.3), unveiled last August. 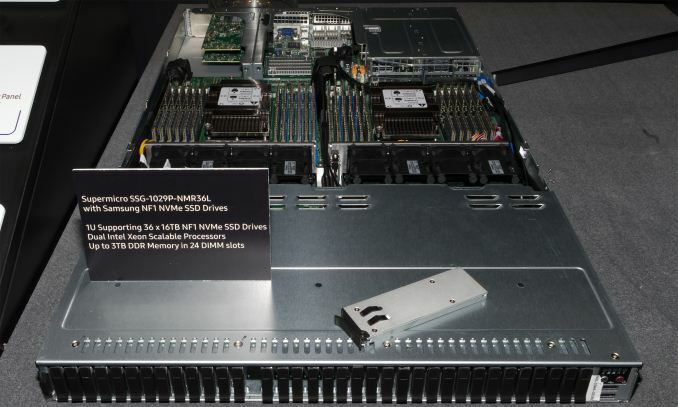 At the OCP Summit this week, the company exhibited its NF1 SSDs in a dual-socket Supermicro server running 36 drives. At the trade show, Samsung demonstrated the PM983 NF1 SSDs featuring 8 TB and 16 TB capacities - this is the first time the company has demoed its 16 TB module in a public display. The NF1 form-factor was specifically designed to accommodate two rows of NAND flash packages, and thus maximize capacities of modular SSDs. Another benefit to the form factor is the ability to hot plug. To be honest, it was half surprising to see the 16 TB version in flesh (which was “disclosed” at last year’s Storage Developer Conference). The PM983 SSDs are based on the Samsung Phoenix controller as well as 64-layer 3D TLC NAND memory. They will be available in both M.2 and NF1 form-factors (with the latter offering higher capacities), but Samsung does not say exactly when. From a performance point of view, Samsung rates the drives at up to 3000 MB/s sustained sequential read speed as well as up to 1900 MB/s sustained sequential write speed. In addition, Samsung also showcased versions with power loss protection capacitors. Samsung formally introduced its NF1 form-factor, and disclosed some general details about it, at last year’s Flash Memory Summit. Since then, the company has been busy developing the ecosystem for the new form-factor, and working with external partners to popularize it. In recent months, Samsung has gained support for NF1 from three well-known companies: ADATA and AIC demonstrated a server featuring bays for NF1 drives running IM3P33E1 SSDs at CES (they called the form-factor ‘M.3’, just like Samsung seemed to call it internally to start), whereas Supermicro introduced its own SSG-1029P-NMR36L machine featuring 36 bays for NF1 drives. The ADATA/AIC server was primarily designed, we were told, to assist with 5G rollout and deployment. The 1U server from Supermicro looks pretty powerful: it features two Xeon Scalable CPUs (with up to 56 cores), 24 DIMM slots supporting up to 3 TB of DDR4 memory, and with 36 NF1 bays it can carry 576 TB of raw NAND flash memory (using the PM983 drives) with hot plug capability. At present this kind of storage density is not achievable in a 1U form-factor, but it is certain that the price tag will look rather astronomical too. 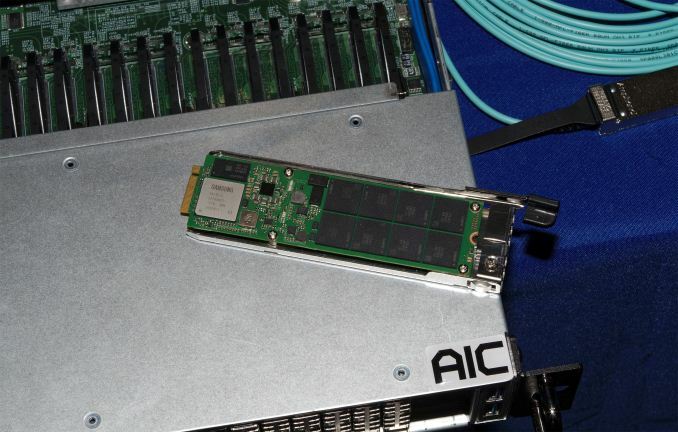 Samsung demonstrated two servers with NF1 bays at OCP Summit, which indicates that for now AIC and Supermicro are the only ones ready. This is not particularly surprising since the server market does not adopt new form-factors overnight. Keeping in mind inertia of the server market, Samsung has also developed adapters for its NF1 SSDs that allow installation into existing machines. The current lineup includes three adapters: an HHHL add-in card with a PCIe 3.0 x4 interface supporting one NF1 SSD, an FHHL add-in-card featuring a PCIe 3.0 x8 interface for two NF1 drives, and a U.2 adapter for two NF1 SSDs with a PCIe switch to maximize performance (or enable dual-port capability) over a PCIe 3.0 x4 interface. The form of that PCIe switch was not disclosed. All the adapters support hot-plug capability, so they maintain the key advantages of the form-factor: high density and hot plug. Even more importantly, they enable Samsung (and other adopters of NF1) to compete for industry-standard servers using SSDs in a new form-factor. I have a 11 or 12 Year Old Supermicro workstation that still could run - latest Windows 10 update does not boot - but I think it because the Audio driver - but machine turns on and works. What is 36 Bay, 1U, Massive Amount of SSD Storage got to do with 5G? Sorry I am not seeing the link here. Most of the stuff people do on mobile devices doesn't benefit from caching. "Reliance Jio said that under multi-access edge computing deployment, the CDN is integrated into the mobile LTE network with edge caches in close proximity to the mobile users. With a mobile CDN, the mobile operator can deliver content via edge cloudlets to provide a better user experience with lower latency and higher performance. 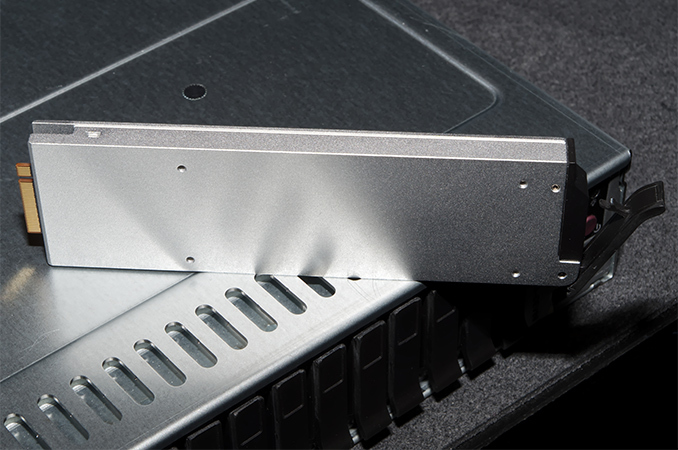 Datacentre in a 1U enclosure. You'd think two of these (for redundancy) would surely be enough for any business with up to 1000 employees.